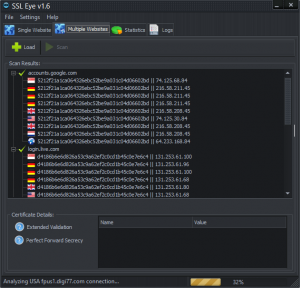 SSL Eye is a unique tool that is designed in a way it can detect man in the middle spying, by comparing of single or multiple sites across many remote nodes that are owned and managed by EEDS located in different countries such as Singapore, USA, UK, Germany and Netherlands. This is done by comparing the other nodes finger prints results with yours that comes through your local ISP. Additionally the tool will tell you if the site is using Extended Validation () certificates or perfect forward secrecy through the key exchange mechanism such as DHE_RSA or ECDHE_RSA which is currently being used by Google Inc. We have also implemented global short-cut keys on the application that allows you to copy a site from the browser address bar and call it for instant scan to check if you are a victim of Man in The Middle Attack (). Where normally attackers listen to your communication channel in a public key exchange re-sends the keys on your behalf, substituting his own fake keys for the requested one, so that the two original parties (you and your bank) will still appear to be communicating with each other. (view screenshots 1 – 2 – 3). Retrieve fingerprint of any given domain from single or multiple sites with support. Check if the site is using Validation (EV) certificates. Check if the site is implementing forward secrecy on key exchange. Export results into HTML report. Sound alerts for invalid certificates. Scan with global keys from clipboard without user interaction. What if you find out that you are a victim and the fingerprint does not match with all other nodes ? Or you are worried about Prism ? Well the answer is use Stealth Walker it will protect and encrypt all your traffic. Server Name Indication (SNI) is an extension to the TLS computer networking protocol by which a client indicates which hostname it is attempting to connect to at the start of the handshaking process. In cryptography, forward secrecy (abbreviation: FS, also known as perfect forward secrecy or PFS) is a property of key-agreement protocols ensuring that a session key derived from a set of long-term keys cannot be compromised if one of the long-term keys is compromised in the future. Multithreading is the ability of a program or an operating system process to manage its use by more than one user at a time and to even manage multiple requests by the same user without having to have multiple copies of the programming running in the computer. Same for me. It fetches SSL fingerprint only from the first (Singapore) node, after that it trying to fetch SSL fingerprint from the second (Germany-1) node, but that does not works. I can’t see results even from my ISP. Wonderful program. Are you going to release an update? It’s been a couple of years since the last version. Hi ! I don’t know what to think : when I scan Youtube, it gives me a different fingerprint from my ISP for many servers. And when I try Google.com (.fr, it makes my isp in blue/green), it makes my ISP also different but in red. What does it mean ? I have no problems for any other websites, and I noticed it’s always been with Google that there is always something different. Is it normal ? 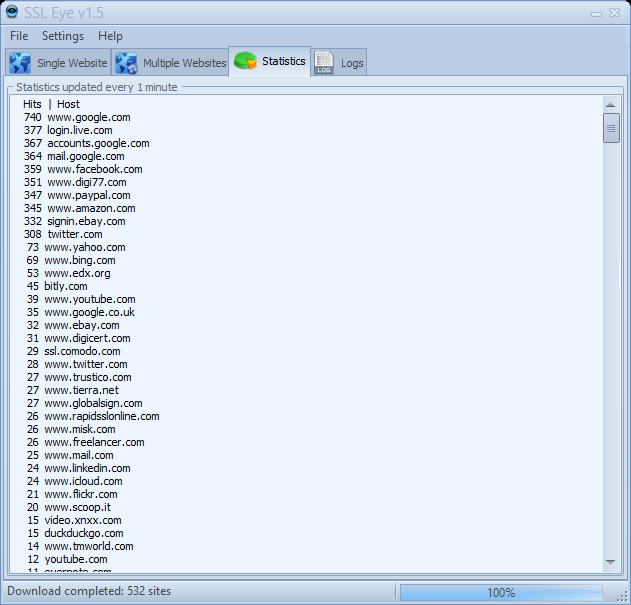 I can’t comment about your ISP but here are my results tested through VPN in USA. I could pay for this to be available on my Mac. Thank you Thomas I will consider having a Mac version if I get more requests. Can you please build a software update check into the application? Also would be nice to have a link in the about menu pop-up that leads straight to the product page, instead of the main web site. Sure Seth, I will consider your suggestions on the next release thank you. Thank you for mentioning our software. We are constantly trying to improve it and make it more useful for our users. If you have recommendations and we can accommodate them we will. For google.com it was a bug that will be fixed on the next release but for google.co.uk its a bit strange I tried it on Linux nodes and I get the same result which is different than Firefox or Chrome.. Still working on it will update you.. The reason IE on Windows XP was getting the same certificate fingerprint as SSL Eye from http://www.google.co.uk was because neither supported Server Name Indication (SNI). Internet Explorer 7 or later, on Windows Vista or higher. Does not work on Windows XP, even Internet Explorer 8 (because the support of this feature is not browser version dependent, it depends on SChannel system component which introduced the support of TLS SNI extension, starting from Windows Vista, not XP). You’re welcome. 🙂 It’s because I forgot to put the command in code tags that it came out like it did. I miss the preview post button like on forums. 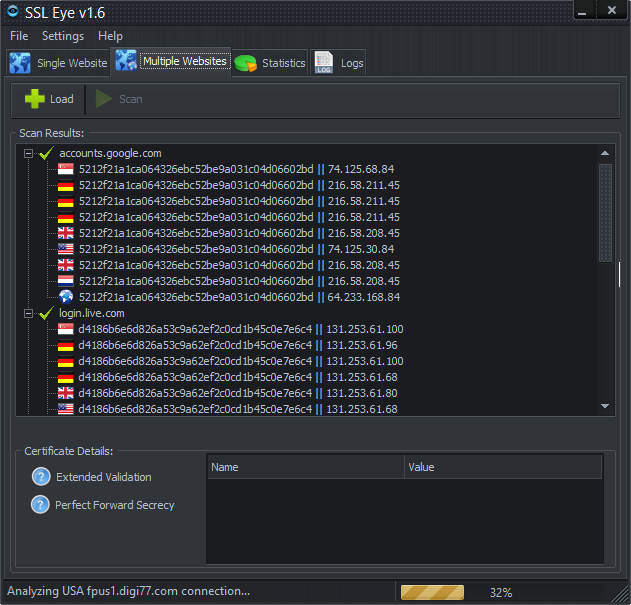 SSLEYE 1.5 has been released and the bug has been fixed with some extra features added. Thank you for your valuable input again please try the new verion and spread the word in wilderssecurity thread you mentioned earlier. Thank you for reporting this issue we are looking into it and we will get back to you as soon as possible. Looks like an excellent tool….thanks you very much to give me/us the opportunity to use it for FREE! Just a question for you: do you know if freeware like “blackbelt privacy” and/or “CryptSync” can also be used as a means to avoid or at least minimize the risk of the Man-in-the-middle attack? Thank you as well for trying SSLEye. 1 – Duplication of files (Unless you use your cloud for backup only).Then I would go for Crashplan. 2- Uses 7-zip to encypt which is limited to AES-256. To overcome this limitation and have stronger encryption I would use Truecrypt container and sync it to the cloud using CryptSync. If you are using Dropbox and you need to access files in more than one device then replace True-crypt with PGP. BlackBelt the only advantage I see is them using your current installed Fire-fox winch overcomes the limitation of using Tor-bundle that unfortunately is always packed with out of date Firefox package. However if you would like to have a tool that has more features such as  vpn + Tor + Dns encryption then use Stealthwalker. In short BlackBelt and CryptSync minimize the risk of unwanted eyes on your content and connection however there are better alternatives that do the same in better quality. Both SSL labs and BlackBeltof can be used to validate SSL certificate but non of them would detect SSL Man in The Middle attack or spy as SSLEye does by validating the finger print of any certificate not only from your PC but from other remote nodes as well. Thank you very much for your exaustive reply. Honestly I was not aware of StealthWalker, which seems to me simply amazing: how the heck is a tool like this FREE of charge? By the way, what do you make of this Free ​Cross-platform Multi-protocol VPN program? Your are most welcome, Its free for the sake of marketing.However we still have a premium package for users who wish to have dedicated and faster servers. Regarding Sofethere the idea is brilliant to support all protocols which are widely used plus their own Ethernet over SSL protocol which is transparent on firewalls. Once they release the source code of their server we will consider switching to Sofehere. With no doubts they the Japanese developed a powerful tool. 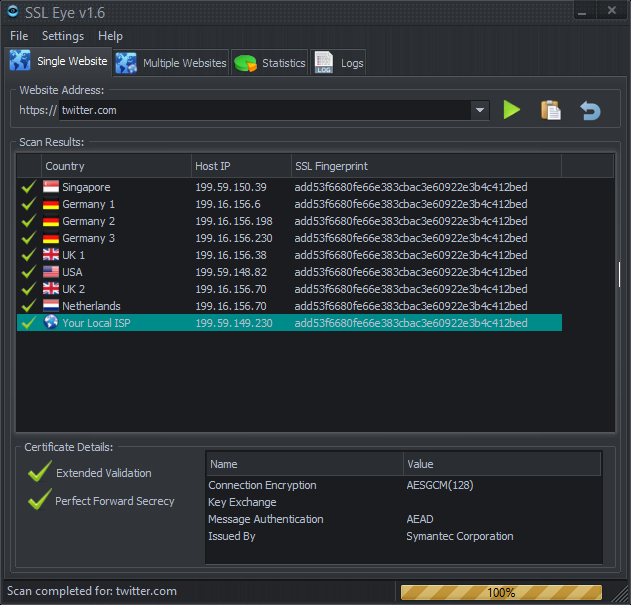 Thank you Hartcher they are similar in functionality but SSLEye has more functions like multiple defined list + Extended validation check + Perfect forward secrecy check and Report export all in one easy GUI.